Dressing for a job interview can sometimes be a challenge—what you wear can depend on the kind of job you're applying for and the culture of the company itself. What you'd wear to an interview at Facebook might be very different from what you'd wear to an interview with Goldman Sachs, for example. 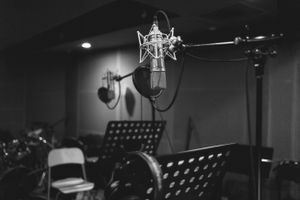 What about a music business job interview? That can be extra tough. You don't want to come off looking too, you know, "business-y," but you also don't to come off looking like a slob who isn't taking the potential job seriously. How do you strike the right balance? Consider the Position. You may be thinking that you don't want to look like you're interviewing with a law firm or an investment bank, but if you're interviewing to do legal work or financials within the music industry, that is exactly who you're interviewing with and how you should look. For instance, the legal team at a major record label is probably going to want to see you dressed as a legal professional when you show up to interview. Even if the office culture is more relaxed, go for professional business attire for these types of interviews and save the Ramones t-shirt for when you have the job. Consider Office Culture. If you've ever visited the company, you already have a feel for the general dress code, but if you've never been through HQ front doors, use the company's website and social media profiles to get a read on the casualness of the office environment. You may also be able to draw some general conclusions based on the type of music industry work the business does. If they're a music marketing company out meeting people regularly, for example, the dress code may be turned up a notch when compared to a small indie label that has three people on staff and is based in someone's home office. Dress One Step up From the Dress Code. Whatever you assume the company's usual dress code to be, dress for your interview one step up from there. If you think the company employees usually wear jeans and tees, rock what your mom might call "dress slacks" or skirt, for example. It should land you in the "I'm taking this job seriously, but I'm not so overdressed that I stick out" category—a good place to be. When in Doubt, Pull out All the Stops. You may feel a little uncomfortable sitting there in your polished attire; the only one in the office without stains of indeterminate provenance on their clothes. But, it's not nearly as uncomfortable as you'd feel if you're the only one in the building dressed in what you plucked from the pile of clothes on your floor that morning. Job interview fashion is one area in which overdoing it is far better than under-doing it. What do you do if you completely misjudged your interview attire? Take it in stride and don't let it throw you off your game during the interview itself. You can outshine your clothes. Remember, they're not looking to hire you for your fashion sense. If it feels right, you can make a little joke about your clothing misfire to break the ice. If it doesn't, just get your game face on and dazzle them with your music industry knowledge and experience. Someday, after you've landed the job, you can look back and laugh and be glad you don't have to go through the interview again.